This story started way back when in the year of 1940. 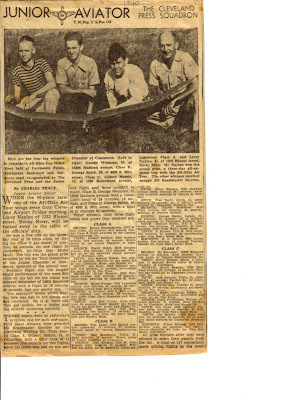 Gil Morris at the age of fifteen years old entered a model airplane contest in Cleveland, Ohio. Gil entered Class A Gas and won first place. 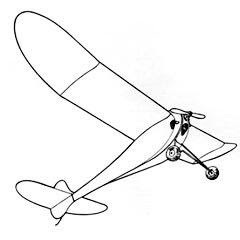 Gil flew two models of his own design; both of which flew out of sight and were lost. Gil's flight times entitled him to first place. Gil had a choice of a bicycle or a cash prize. He chose the cash prize so he could buy engines for the ones he lost that day. Another young man, George Reich, at the age of twenty years old also entered that contest. George entered Class C Gas and won first place. George flew a model of his own design called the Albatross. George chose the bicycle for his prize, which was later stolen from his home. Gil remembered how beautiful the Albatross flew and so did the news photographer. The first place contestants were gather together behind George Reich and his Albatross for a photo. Gil had the newspaper article in his scrape book and a copy is attached. Gil Morris always wanted to build the George Reich Albatross and so he did, sixty seven years later! 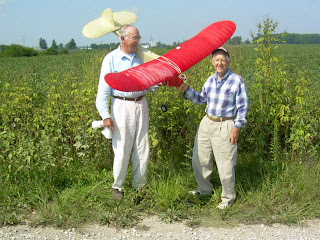 Gil flew the Albatross for George on September 4, 2007 at the Shelby Airport in Ohio. Sorry, the only photo of the Albatross in flight by your author captured the Monarch butterfly in flight. That little red dot above the butterfly is the Albatross. The Albatross climbed out briskly under half power and went in to a beautiful glide. The Albatross DT into a corn field and was quickly retrieved, George Reich was thrilled by the flight as were all the on lookers. Gil Morris was thrilled to have photos taken with George and the Albatross. Gil powered the Albatross with an O&R large front rotor and large exhaust engine swinging a Top Flight 14- 6 prop. 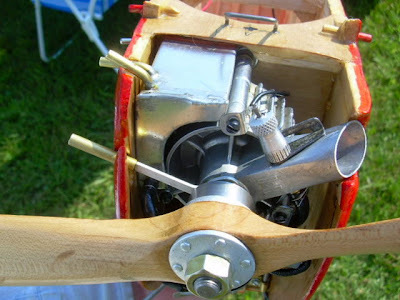 The engine was mounted inverted as was the Dennymite engine George used in his Albatross back in 1938. The inverted O&R would not run properly inverted. Gil had to rotate the intake so it was sixty degrees above the horizontal, as you can see from the photos, and install a crankshaft with the proper timing. 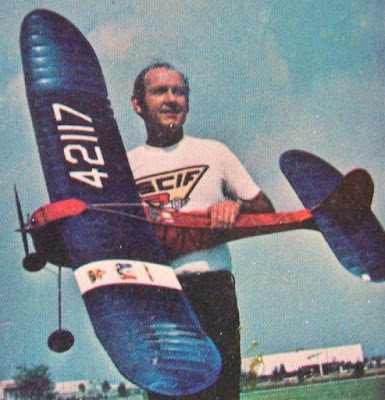 Gene Bowers an old time free flight flyer and a very good friend of Gil had the crankshaft. What are friends for anyways. Also from the photos you can see the gas tank Gil made to fit around the crankcase to keep the weight up front; pretty neat. Gil built a duct to exhaust the hot air from the cooling fins of the engine out the bottom of the fuselage. The wing was built in two pieces for easier transportation. 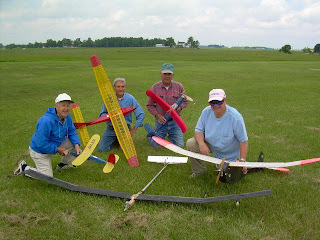 Gil is going to fly the Albatross at the 2007 SAM Champs in Las Vegas. It was a great day for all that attended Gil's flight of his Albatross, everybody had a smile on their face. What is George Reich doing now a days? Well as you can see from the photos, George just completed a Gollywock and is getting ready for a checkout flight.